While I’ve been in the communications industry for a while (read the lines on my face! ), every now and then I have the opportunity to meet someone who wows me. I had that feeling two weeks back when I met with Caroline Sapriel. Caroline, who is an expert in crisis management and communications, was invited along by the International Association of Business Communicators to talk about her insights on crises. What with all that is happening globally, it seemed apt to talk about how we can communicate better on issues that have an adverse impact, both on reputations and operations. Now, to the good news. Organizations rarely face true crises, issues which can substantially damage or stop operations and ultimately destroy reputations. However, most crises are still handled incorrectly. Many leaders look to manage a crisis in the same way as they manage through normal times, by forming a consensus and aligning others. However, Caroline states that a crisis needs a different type of behaviour, one that follows a command and control model where one person takes charge and acts decisively, with or without the approval of others. She spelled out five key competencies that leaders need to navigate a crisis. Now, let’s come to our role as communicators. Caroline was very kind to share her company’s integrated business contingency framework as well as spell out her 10 commandments of crisis management, which are based on decades of hands-on experience as well as research. 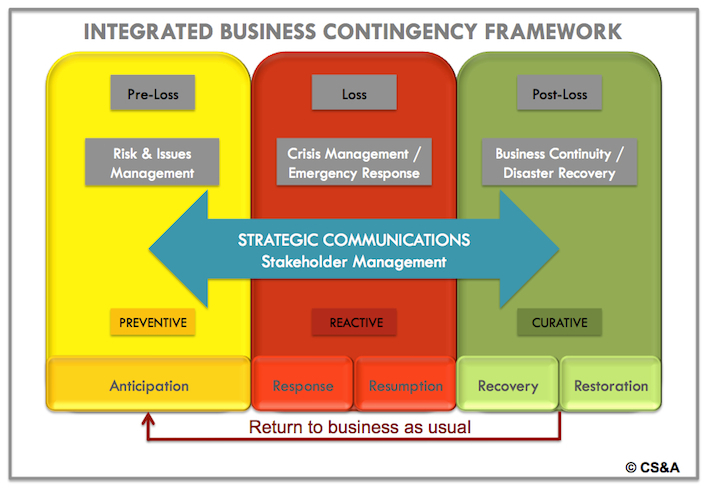 CS&A’s integrated business contingency framework seeks to explain how communications and stakeholder management can support organizations in a crisis, through every stage of a crisis. #9 If the crisis drags, don’t retreat into a siege. Stay out there! Caroline adds that in a crisis we can’t control the events, but we can control our credibility. If you’re wondering how your organization is doing, have a look at the below image which has been developed by Caroline and her organization. 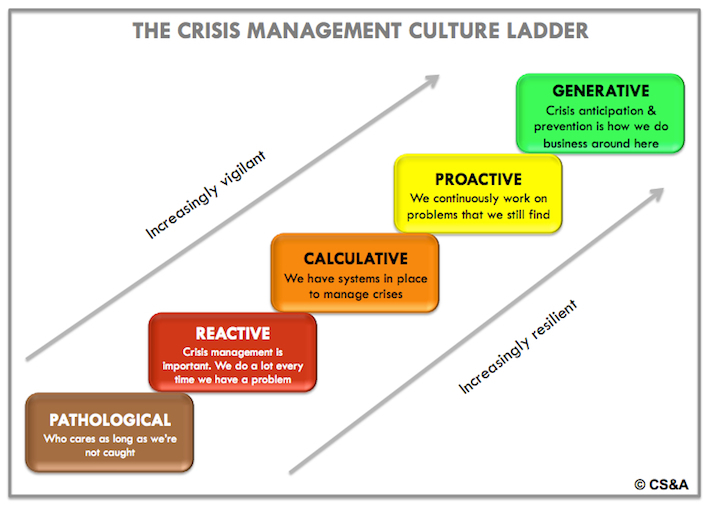 The crisis management culture ladder will help you to understand where you are in terms of preparing your organization for a crisis. As an additional plus, Caroline has shared a reading list that will help guide you on improving your understanding of crises and what you should do to prepare as a communicator and leader. On a final note, I’d like to thank Caroline for her time. And if you’re interested in knowing more about Caroline Sapriel, she’s the managing partner and founder of CS&A International, a pioneer and a recognised leader in the field of risk, crisis and business continuity management. For additional information please visit her company’s website. This entry was posted in Public Relations and tagged 10 commandments of crisis communications, Caroline Sapriel, crisis communications, crisis management culture ladder, CS&A International, IABC, integrated business contingency framework, International Association of Business Communicators by alexofarabia. Bookmark the permalink.